The aggregate market value of the voting stock held by nonaffiliates of the registrant was $442,729,184 based on the closing price per share of $10.20 on May 31, 2018, the last business day of the registrant’s most recently completed second quarter. As of January 22, 2019, there were 44,846,069 outstanding Common Shares of the Company’s $0.10 par value. Portions of the 2019 Proxy Statement of OMNOVA Solutions Inc. are incorporated into Part III of this Report. OMNOVA Solutions Inc. (referred to in this report as "OMNOVA Solutions", "OMNOVA", the "Company", "we", "us", or "our") became an independent, publicly-traded company on October 1, 1999, when it was spun off by GenCorp Inc., its former parent company. OMNOVA Solutions is incorporated under the laws of the State of Ohio, and its headquarters is located at 25435 Harvard Road, Beachwood, Ohio 44122-6201. OMNOVA Solutions is a global innovator of performance enhancing chemistries and surfaces for a variety of commercial, industrial and residential end uses. Our products provide a variety of important functional and aesthetic benefits to hundreds of products that people use daily. We hold leading positions in key market categories, which have been built through innovative products, customized product solutions, strong technical expertise, well-established distribution channels, recognized brands, and long-standing customer relationships. We have strategically located manufacturing, technical and other facilities globally to service our broad customer base. During fiscal 2018, OMNOVA operated two business segments: Specialty Solutions and Performance Materials. We derived 63% of our 2018 net sales from the Specialty Solutions segment and 37% from the Performance Materials segment. Financial information relating to the Company’s business segments is included in Note O to the Consolidated Financial Statements of this report. The Specialty Solutions segment consists of three business lines: Specialty Coatings & Ingredients, Oil & Gas, and Laminates & Films. The Specialty Solutions segment develops, designs, produces, and markets a broad line of specialty products for use in coatings, adhesives, sealants, elastomers, laminates, films, nonwovens, and oil & gas products. These products are used in numerous applications, including architectural and industrial coatings; nonwovens used in hygiene products, filtration and construction; drilling additives for oil and gas drilling, cementing and fracking; elastomeric modification of plastic casings and hoses used in household and industrial products and automobiles; tapes and adhesives; sports surfaces; textile finishes; commercial building refurbishment; new construction; residential cabinets; flooring; ceiling tile; furnishings; manufactured housing; health care patient and common area furniture; and a variety of industrial films applications. The segment's products improve the performance of customers’ products, including stain, rust and aging resistance; surface modification; gloss; softness or hardness; dimensional stability; high heat and pressure tolerance; and binding and barrier (e.g. moisture, oil) properties. Specialty Coatings & Ingredients. OMNOVA Specialty Coatings & Ingredients is a leading global supplier of polymers, waterborne and solvent borne dispersions, elastomers, and other specialty chemicals for a variety of product categories. Applications for our specialty polymers and chemicals include: specialty coatings; nonwovens (such as disposable hygiene products, engine filters, roofing mat, scrub pads); construction; adhesives; tape; floor care; textiles; graphic arts; home & personal care; and various other specialty applications. Our focus is on developing unique products for custom applications that address specific customer needs, including enhanced functionality, improved durability, high temperature, chemical and UV resistance, corrosion resistance, improved environmental performance, and improved processibility. Sales of our Specialty Coatings & Ingredients products represented 33% of our consolidated net sales for 2018, 29% for 2017, and 29% for 2016. Oil & Gas. OMNOVA's Oil & Gas is a leading supplier of specialty wellbore chemicals used in demanding applications all over the world. We offer a wide range of solutions including fluid loss control and sealing, emulsifiers, lubricants, and rheological modifiers for drilling fluids. The business also offers flow control and properties enhancement in cementing operations, gel additives for hydraulic fracturing fluids, and strengthening agents. We design unique polymers that meet conventional and unconventional drilling and completion requirements. Sales of our Oil & Gas products represented 9% of our consolidated net sales for 2018, 7% for 2017, and 6% for 2016.
kitchen and bath cabinets; manufactured housing and recreational vehicle interiors; flooring; commercial and residential furniture; retail display fixtures; home furnishings; consumer appliances; bath and spa surrounds; food service tables; wall protection; and architectural accents. Films applications include: luxury vinyl tile (LVT); awnings; tents; flooring; promotional graphics; medical products; movie screens; decking; ceiling tile; and shower pan liners. Sales of our Laminates and Films products represented 21% of our consolidated net sales for 2018, 20% for 2017, and 18% for 2016. A key strength of our laminates business is our coating technology, including ultraviolet, melamine, urethane, and thermally cured coatings, which provide greater durability for high-wear applications. In addition, our laminates business has differentiated itself in the market as a single-source supplier through its harmony programTM of integrated vinyl and paper laminate designs for the furniture and cabinet industries by building a unique library of matched vinyl and paper laminate designs, with a variety of patterns and textures, and developing rapid make-to-order production capabilities. We also offer SURF(X)® 3D Laminates for multi-dimensional applications for the office and health care furniture and retail display fixture and food service markets. These laminates offer a cost effective alternative to high pressure laminates, thermally fused melamine and real wood veneers. They provide furniture makers with design flexibility in rounded surfaces, eliminating the need for unsightly and expensive edge-banding, and providing enhanced cleanability/disinfection and durability with increased chip and crack resistance. The Specialty Solutions segment includes many product categories that are performance driven, where product innovation, technical service, application support, and key account focus are key competitive differentiators. Each product line markets its products to different industries under numerous brand names. Our Specialty Solutions segment primarily sells its products directly to manufacturers through dedicated internal marketing, sales, and technical service teams focused on providing highly responsive customized solutions. Distributors are used to help expand sales coverage geographically and with newer customers. The Performance Materials segment serves mature markets including plastics, paper, carpet and coated fabrics with a broad range of polymers based primarily on styrene butadiene (SB), styrene butadiene acrylonitrile (SBA), styrene butadiene vinyl pyridine, high styrene pigments, polyvinyl acetate, acrylic, styrene acrylic, calcium stearate, glyoxal, and bio-based chemistries. Performance Materials' custom-formulated products are tailored latexes, resins, binders, antioxidants, hollow plastic pigment, coated fabrics, and rubber reinforcing which are used in tire cord, polymer stabilization, industrial rubbers, carpet, paper, and various other applications. Its products provide a variety of functional properties to enhance the Company’s customers’ products, including greater strength, adhesion, dimensional stability, ultraviolet resistance, improved processibility, and enhanced appearance. Paper and Carpet. OMNOVA Solutions is an innovative supplier of custom-formulated SB and SBA latex and hollow plastic pigments for carpet, paper and paperboard coatings. Applications for our products include paper and paperboard coatings used in specialty papers, food cartons, household and other consumer and industrial packaging, magazines, catalogs, direct mail advertising, and brochures. Our products for the carpet industry secure carpet fibers to the carpet backing and adhere the primary backing to the secondary backing, while meeting the stringent manufacturing, environmental, odor, flammability, and flexible installation requirements of our customers. Our strong historical position in residential carpeting has been enhanced by new products to serve that market, as well as innovations in commercial carpet backing binders that provide moisture barrier and other properties, enabling the replacement of higher cost polyurethane binders. Sales of our Paper and Carpet products represented 15% of our consolidated net sales for 2018, 24% for 2017, and 23% for 2016. Performance Additives. OMNOVA is also a leading global supplier of vinyl pyridine latex which is used in bonding fabric to rubber for tire and belting applications. In addition, the Company is a leading global supplier of antioxidants used in polymer stabilization and synthetic latex gloves. Sales of our Performance Additives products represented 16% of our consolidated net sales for 2018, 13% for 2017, and 14% for 2016. Coated Fabrics. OMNOVA Solutions is a leading North American and Asian supplier of vinyl and urethane coated fabrics for transportation, marine, commercial, residential, and health care applications. Our durable coated fabrics are well-suited for demanding, high-use environments and offer a cost effective alternative to other surfacing materials, such as leather and textile fabrics. Applications for our coated fabrics include: transportation seating (automotive OEM, bus and other mass transit, marine, and motorcycle); automotive aftermarket applications; contract and health care furniture; residential applications; stadium and arena seating; and healthcare equipment. A key differentiator for our coated fabrics products is our PreFixx® protective coating, long recognized for delivering the industry's best-in-class performance. Sales of our Coated Fabrics products represented 6% of our consolidated net sales for 2018, 7% for 2017, and 10% for 2016. Our Performance Materials segment is a leader in its targeted product categories, which are highly competitive based on quality, customer service, product performance, supply chain, field technical support, and product innovations. Our Performance Materials segment primarily sells their products directly to manufacturers through dedicated internal marketing, sales, and technical service teams focused on providing highly responsive customized solutions. Distributors are used to help expand sales coverage geographically and with newer customers. Our Performance Materials segment distributes its products primarily through a direct sales force and agents to manufacturers of retail store fixtures, cabinets, furniture, seating, and health care components, and other products. Many of our Coated Fabrics products have strong, well-recognized brand names that are promoted through trade shows, industry periodicals, our website (www.omnova.com), and other media. OMNOVA’s Performance Materials segment competes with numerous companies, including international companies. Many of these companies focus on only one product line and/or market and are smaller and privately-owned. Net sales from our foreign operations were $320.2 million in 2018, $301.4 million in 2017, and $305.9 million in 2016. These net sales represented 41.6% of our total net sales in 2018, 38.5% in 2017, and 40.3% in 2016. Long-lived assets primarily consist of net property, plant, and equipment. Long-lived assets of our foreign operations totaled $90.1 million at November 30, 2018, $84.2 million at November 30, 2017, and $77.4 million at November 30, 2016. Our consolidated long-lived assets totaled $205.8 million at November 30, 2018, $208.9 million at November 30, 2017, and $202.7 million at November 30, 2016. We regard patents, trademarks, copyrights, and other intellectual property as important to our success, and we rely on them globally to protect our investments in products and technology. Our patents expire at various times, but we believe that the loss or expiration of any individual patent would not materially affect our business. We, like other companies in the industries in which we operate, may be subject to claims of alleged infringement of the patents, trademarks, and other intellectual property rights of third parties from time to time. We historically experience stronger sales and income in our second, third, and fourth quarters, comprised of the three-month periods ending May 31, August 31, and November 30. Our performance in the first quarter (December through February) has historically been affected by generally lower levels of customer manufacturing, construction, and refurbishment activities during the holidays and cold weather months. Our business operations are subject to numerous federal, state, local, and foreign environmental laws and regulations. These laws and regulations not only affect our current operations, but also could impose liability on us for past operations that were conducted in compliance with then applicable laws and regulations. For further discussion of capital and noncapital expenditures for environmental compliance, please refer to “Management’s Discussion and Analysis of Financial Condition and Results of Operations—Environmental Matters” of this report, which is incorporated herein by reference. As of November 30, 2018, the Company employed approximately 1,900 employees globally. Approximately 11% of the Company’s U.S. employees are covered by collective bargaining agreements in the U.S. of which approximately 140 employees are covered by agreements that expire within the next 12 months. In addition, certain of our foreign employees are also covered by collective bargaining agreements. We utilize a variety of raw materials, primarily monomers, in the manufacture of our products. Most of these raw materials have been, and we expect will continue to be, generally available from multiple suppliers. Monomer costs, which are a major component of the polymers-based products, include butadiene, styrene, acrylates, acrylonitrile, vinyl acetate and vinyl pyridine, polyvinyl chloride (PVC) resins, textiles, plasticizers, paper, and titanium dioxide. The cost of raw materials has a significant impact on our profitability. We generally attempt to respond to raw material cost increases through productivity programs and price increases to our customers. The success of attempted price increases depends on a variety of factors including the specific market application and competitive environment. Under certain circumstances, we are not able to pass along some or all of the increase. In addition, if accepted by customers, price increases generally lag the increase in raw material costs. Index pricing applies to approximately 25% of our total net sales. OMNOVA Solutions' technology and design centers support research and development efforts across our businesses and complement the resources focused on innovation in both of our segments. Our efforts are focused on developing new applications with our base technologies and enhancing the functionality of our products in existing applications, as well as developing new product and technology platforms. Research and development costs were $17.7 million in 2018, $18.9 million in 2017, and $20.8 million in 2016. Our research and development costs relating to new products were $6.1 million in 2018, $7.5 million in 2017, and $8.2 million in 2016. Research and development expenses include the costs of technical activities that are critical to developing new products, services, processes or techniques, as well as those expenses for technical activities that may improve existing products or processes. Information relating to research and development expense is set forth in Note A to the Consolidated Financial Statements of this report. Solutions Board of Directors are also available on our website and in print to any shareholder who requests a copy. All requests must be made in writing and addressed to OMNOVA Solutions Inc., Attn: Corporate Secretary, 25435 Harvard Road, Beachwood, Ohio 44122-6201. This Annual Report includes descriptions of our current business, operations, and financial condition, as well as “forward-looking statements” as defined by federal securities laws. All forward-looking statements by the Company, including verbal statements, are intended to qualify for the protections afforded forward-looking statements under the Private Securities Litigation Reform Act of 1995. Forward-looking statements reflect Management’s current expectation, judgment, belief, assumption, estimate or forecast about future events, circumstances or results and may address business conditions and prospects, strategy, capital structure, debt and cash levels, sales, profits, earnings, markets, products, technology, operations, customers, raw materials, claims and litigation, financial condition, and accounting policies among other matters. Words such as, but not limited to, “will,” “may,” “should,” “projects,” “forecasts,” “seeks,” “believes,” “expects,” “anticipates,” “estimates,” “intends,” “plans,” “targets,” “optimistic,” “likely,” “would,” “could,” "committed," and similar expressions or phrases identify forward-looking statements. All descriptions of our current business, operations and financial condition, as well as all forward-looking statements, involve risks and uncertainties. Many risks and uncertainties are inherent in business generally. Other risks and uncertainties are more specific to the Company’s businesses and strategy, or to any new businesses which the Company may enter into or acquire. There also may be risks and uncertainties not currently known to us. The occurrence of any of such risks and uncertainties and the impact of such occurrences is often not predictable or within the Company’s control. Such impacts could adversely affect the Company’s business, operations, or financial condition, as well as the Company's actual and projected results and the value of an investment in the Company. In some cases, such effect could be material. Certain risks and uncertainties facing the Company are described below or elsewhere in this Annual Report. All written and verbal descriptions of our business, operations and financial condition and all forward-looking statements attributable to the Company or any person acting on the Company’s behalf are expressly qualified in their entirety by the risks, uncertainties, and cautionary statements contained and referenced herein. All such descriptions and any forward-looking statement speak only as of the date on which such description or statement is made, and the Company undertakes no obligation, and specifically declines any obligation, other than that imposed by law, to publicly update or revise any such description or forward-looking statements whether as a result of new information, future events or otherwise. Our business is sensitive to general economic, business, and industry conditions. We are exposed to general economic, business and industry conditions, both in the United States and internationally. Adverse global economic and financial conditions are difficult to predict and mitigate against, and therefore the potential impact is difficult to estimate. The end markets that we serve can be sensitive to changes in general economic conditions and can be volatile, with significant, rapid, and unpredictable reductions in demand and/or increases in raw material and other costs. Adverse general economic conditions may cause, among other things, significant reductions in available capital and liquidity from banks and other credit providers, substantial volatility in equity and currency values worldwide, and/or a prolonged recessionary or slow growth period. In addition, downturns in our customers’ particular industries, and markets, even when overall economic conditions are favorable, may also adversely affect our sales, profitability, operating results, and cash flows. Our suppliers may be similarly affected by general economic conditions which may affect their access to capital and liquidity, and which may in turn cause them to raise prices or reduce or eliminate production. Raw material prices and availability have a significant impact on results. The cost of raw materials has a significant impact on results. The principal raw materials that we use in our business are derived from petrochemicals and chemical feedstocks. The prices of many of these raw materials are cyclical and volatile and are affected by supply and demand factors beyond our control. While we generally attempt to pass along higher raw material costs to our customers in the form of price increases, there historically has been a delay between an increase in our raw material costs and our ability to increase the prices of our products. Additionally, we may not be able to increase the prices of our products due to competitive pricing pressure and other factors. We generally have multiple global raw material suppliers. However, in some cases there are a limited number of suppliers which are capable of delivering certain raw materials that meet our standards. Certain raw materials are only available from a single source. While we use a limited number of raw materials which are available only from a single source and we order those materials in limited quantities, the loss of any of these raw materials could significantly impact our ability to deliver differentiated products in some of our most specialized businesses. Accordingly, sole source and limited source suppliers generally have greater pricing and supply leverage. In some cases, we may choose to sole source certain raw materials to obtain certain commercial advantages, including superior pricing and terms. Any disruption in raw material availability from one of these suppliers may require us to secure raw material supplies from alternative suppliers on less favorable terms. Various factors, including feedstock shortages, production disruptions, natural disasters, the financial stability of our suppliers, supplier commitments to others, and internal raw material use by suppliers have reduced and eliminated, and in the future may reduce or eliminate, the availability of certain raw materials. Additionally, disruptions in transportation could delay receipt of raw materials. As a result of any of the foregoing events, higher prices and shortages could occur in the future, which may result in customers switching to substitutes for our products. The occurrence or threat of extraordinary events, including natural disasters, political disruptions, terrorist attacks, public health issues, and acts of war, could significantly disrupt production, and decrease market demand for our products. Extraordinary events, including natural disasters, political disruptions, terrorist attacks, public health issues, and acts of war could adversely affect the economy generally, and disrupt our business and operations resulting in a loss of sales and customers. In addition, in many cases we do not have redundant manufacturing or transportation capability and thus, any disruption of production or transportation may result in loss of sales and customers. Such events may also disrupt our supply chain and access to necessary raw materials. We are subject to the risks of doing business in foreign countries and markets. •government expropriation of a business or assets. We participate in highly competitive markets. Many of the markets in which we operate are highly competitive. The bases of competition may include product performance and quality, price, product availability, and security of supply and customer service. Some of our competitors are larger and have more financial resources than us. We may also experience increased competition from companies that offer alternative products based on technologies and processes that have superior performance or better pricing, which could cause a decline in the market acceptance of our products. The increasing pressure from our competitors to keep pace and develop new technologies and products requires us to incur substantial expense. Ongoing consolidation in various industries continues to create individual customers with greater purchasing power and competitors with greater financial and other resources. Customers in established markets like the United States and Europe face their own competitive pressures, particularly from businesses in regions with lower overhead costs. These competitive pressures may require us to reduce prices and attempt to offset such price reductions with improved operating efficiencies and reduced expenditures, which options may be limited or unavailable. Additionally, larger competitors may be better positioned to weather prolonged periods of reduced prices, which may incentivize them to reduce prices even when not dictated by market and competitive conditions. We are subject to extensive and increasing governmental regulation. Our business is subject to numerous foreign, federal, state and local regulations which govern and restrict numerous aspects of our business and involve significant compliance cost. These regulations may change rapidly, and new regulations or interpretations of regulations may be applied to us, due to circumstances beyond our control. We expect regulations, and the costs associated with compliance, to continue to increase. Among these regulations are increasingly stringent environmental and health and safety regulations. The cost of compliance with these regulations is significant and increasing, and violating these regulations can result in substantial costs, including fines, damages, criminal or civil sanctions, remediation costs, and interruptions in our operations. These regulations may also restrict or prohibit our ability to use certain raw materials key to our products or prohibit the sale of our products altogether. Certain environmental requirements provide for strict, and under certain circumstances joint and several, liability for investigation and remediation of releases of regulated materials or from properties owned or operated by us or our predecessors and from properties where substances were sent for off-site treatment or disposal. We may be unable to effectively protect our intellectual property or may be subject to intellectual property claims. For certain products we rely on trademark, trade secret, patent, and copyright laws to protect our intellectual property. We cannot be sure that these intellectual property rights will be successfully asserted in the future or that they will not be invalidated or circumvented. In addition, the laws of some foreign countries in which our products are or may be sold do not protect our intellectual property rights to the same extent as the laws of the United States. The failure or inability of us to protect our proprietary information could make us less competitive. From time to time, we may be subject to claims or allegations that we infringe upon or have misappropriated the intellectual property of third parties. Defending against such claims is costly and intellectual property litigation often involves complex questions of fact and law, with unpredictable results. We may be forced to acquire rights to such third-party intellectual property on unfavorable terms (if rights are made available at all), pay damages, modify accused products to be non-infringing, or stop selling the applicable product altogether. We are subject to claims and litigation. From time to time, we are subject to various claims, proceedings, and lawsuits related to products, services, contracts, employment, environmental, safety, intellectual property, and other matters arising out of our business operations or the business operations of our predecessors. Whether founded or unfounded, if any such claims, proceedings, or lawsuits are not resolved in our favor, they may result in significant financial liability, negatively impact our business operations, and harm the reputation of the Company. The costs of investigating and defending against claims can be substantial. We may not have applicable insurance coverage, and any such insurance coverage that we do have may be inadequate to cover the full cost of a particular claim. Resolutions of claims, proceedings, and lawsuits can be unpredictable and can often take years. As a result, any estimates of liability that we may have made could be materially over or understated. Changes in accounting policies, standards, and interpretations could materially affect how we report our financial condition, results of operations, and cash flows. The Financial Accounting Standard Board ("FASB"), regulatory agencies, and other bodies that establish accounting standards periodically change the financial accounting and reporting standards governing the preparation of the Company’s consolidated financial statements. Additionally, those bodies that establish and interpret the accounting standards (such as the FASB and the SEC) may change prior interpretations or positions on how these standards should be applied. These changes can be difficult to predict and can materially affect how the Company records and reports its financial condition, results of operations, and cash flows. In unusual circumstances, the Company could be required to retroactively apply a new or revised standard, resulting in changes to previously reported financial results. We may be subject to the actions of activist shareholders. We have been the subject of activity by activist shareholders, and shareholder activism generally is increasing. Responding to shareholder activism can be costly and time-consuming, disrupt our operations, and divert the attention of Management and our employees from our strategic initiatives. Activist campaigns can create perceived uncertainties as to our future direction, strategy, or leadership and may result in the loss of potential business opportunities, harm our ability to attract new employees, investors, customers, and joint venture partners, and cause our stock price to experience periods of volatility or stagnation. Our manufacturing facilities are subject to operating risks. We are dependent on the continued operation of our manufacturing facilities. These facilities are subject to hazards associated with the manufacturing, handling, storage, and transportation of chemical materials and products, including tank and pipeline leaks and ruptures, explosions, fires, inclement weather, natural disasters, mechanical failure, unscheduled downtime, labor difficulties, transportation interruptions, and environmental risks. These hazards can cause personal injury and loss of life, severe damage to, or destruction of, property and equipment, and environmental contamination. The occurrence of material operating problems at our facilities may diminish or eliminate our ability to manufacture product. Further, from time to time, we may experience capacity limitations in our manufacturing operations. If we are unable to effectively forecast our customers’ demand, it could affect our ability to successfully manage such operating capacity limitations. We may be unable to achieve, or may be delayed in achieving, the objectives and benefits of our cost reduction initiatives. We continuously utilize operational excellence program improvements such as our One OMNOVA initiative, LEAN SixSigma, manufacturing footprint optimization, global supply chain management, Enterprise Resource Planning (ERP) and other initiatives in an effort to improve efficiencies and lower our cost structure. There may be unanticipated difficulties in implementing one or more of these initiatives, and we may not ultimately realize the full benefits of, or be able to sustain the benefits anticipated by, these initiatives. Additionally, even if we achieve these goals, the cost of implementing these initiatives could ultimately exceed their benefits. In addition, certain of these initiatives have resulted in us streamlining and consolidating our manufacturing capacity, increasing the risk of business interruption if a consolidated manufacturing site experiences operational or other difficulties. Our sales and profitability depend on our ability to develop and commercialize innovative new products that can be value priced. Our specialization strategy requires that we develop, introduce, sell, and support innovative new products and technologies on a timely basis and that we make significant investments in research and development to do so. We may be unsuccessful in developing or introducing new products, modifying our existing products, achieving market acceptance of new products, or securing pricing that reflects the investment into and value of our new products. We may not be able to identify or complete transactions with attractive acquisition candidates. As part of our business strategy, we have pursued, and may continue to pursue, targeted acquisition opportunities. Implementing this business strategy requires Management to identify and evaluate acquisition candidates (including potential synergies, business opportunities, and growth prospects), and to successfully negotiate the acquisition with the target company and its stakeholders. There are a limited number of attractive acquisition candidates. Even if we identify attractive acquisition candidates we may not be able to reach agreement on an acceptable acquisition price. If we complete an acquisition, we may not achieve the anticipated benefits, such as reduced costs or increased sales. We may not be able to successfully integrate acquisitions into our operations. inability to maintain uniform standards, controls, procedures, and policies. These risks may be magnified in acquisitions of significant size and scale. If we are unable to effectively integrate operations and personnel in a timely and efficient manner after an acquisition is completed, we may not realize the projected benefits of the acquisition. Our information systems may experience an interruption or a breach in security. We rely heavily on electronic communications, information technology systems (both internal systems and external systems provided by third parties) and the internet to operate our factories, sell our products, fulfill orders, manage inventory, and bill, collect, and make payments. Our systems are vulnerable to damage or interruption from natural disasters, power loss, telecommunication failures, computer viruses, computer denial-of-service attacks, unauthorized intrusion, and other events, any of which could interrupt our business operations. Our business may also be subject to break-ins, sabotage, and intentional acts of vandalism. Cybersecurity attacks can originate from a wide variety of sources, including persons who are linked to terrorist organizations or hostile foreign governments. Those same parties may also attempt to fraudulently induce employees, customers, or other users of our systems to disclose sensitive information in order to gain access to our systems, our data or the data of our customers. Our security systems may not be able to protect our systems from attacks or other disruptions due to the rapid evolution and sophistication of cyberattack methods. Any significant disruption or slowdown of our current or future information systems as a result of a system security failure could disrupt the flow of operational information, cause orders to be lost or delayed, cause disruption and damage to our manufacturing facilities, damage our reputation with our customers, or cause our customers to cancel orders. Additionally, the theft of sensitive data and our inability to protect our trade secrets or information concerns our employees, customers, or suppliers could have an adverse effect on our business, customers, suppliers, and employees. These risks may increase in the future as we increase our usage of mobile platforms and expand our internal usage of third-party, web-based products and applications. We generally do not have long-term contracts with our customers. With some exceptions, most of our business is conducted on a purchase order basis rather than through long-term contracts. Accordingly, customers may elect to discontinue business with us with limited or no notice and with limited recourse by OMNOVA. Certain product lines contribute disproportionately to the Company’s profitability. Certain of the Company’s product lines and certain of its customers contribute disproportionately to the Company’s operating profit. A downturn in the markets those product lines serve, or the loss of these customers, could have an adverse affect on our financial results. We are exposed to credit risk from our customers. We extend credit on most of our sales, which exposes us to the risk of customer nonpayment. In deciding whether to extend credit or enter into other transactions, we may rely on information furnished by or on behalf of customers, including financial statements, credit reports, and other information. We may also rely on representations of these customers or third-parties as to the accuracy and completeness of credit risk related information. The inaccuracy of that information or those representations would affect our ability to accurately evaluate the credit risk of a customer. Even with accurate information, negative changes in economic, business, or industry conditions may increase the credit risk of customers who are initially determined to have acceptable credit risk. Employee healthcare costs continue to increase. We maintain a self-insured healthcare plan under which we generally share the cost of health care with certain of our employees and retirees. Employee healthcare is a significant operating cost for us, and these costs have continued to escalate well in excess of other inflationary trends over the past several years. If healthcare costs continue to increase, we may not be able or willing to pass these costs along to our employees and retirees. We may be unable to attract or retain key employees. Many parts of our business are highly technical and specialized. Global competition for skilled employees meeting our specialized needs is intense and our business success is dependent on our ability to attract highly-qualified new employees or retain our key employees. Our inability to attract necessary talent or the unanticipated departure of any key member of Management or any key employee, could adversely affect our ability to implement strategic initiatives and effectively operate our business. We are subject to collective bargaining agreements with certain employees. Approximately 11% of our employees located in the United States are covered by collective bargaining agreements. In addition, certain employees of our foreign operations are also covered by collective bargaining agreements. We may not be able to renew our collective bargaining agreements on terms similar to current terms, or renegotiate collective bargaining agreements on terms acceptable to us. The prolonged failure to renew or renegotiate a collective bargaining agreement could result in work stoppages. Additionally, in foreign jurisdictions where we operate, national unions and foreign governments may be unable to reach agreements, which could result in work stoppages that are out of the Company’s control. In addition, if a collective bargaining agreement is negotiated at higher-than-anticipated cost, absorbing those costs or passing them through to customers in the form of higher prices may make us less competitive. Our U.S. pension plan is underfunded, requiring the Company to make significant cash contributions to the plan. The Company’s U.S. pension plan is underfunded, and we are required to make significant cash contributions to it to comply with minimum funding requirements imposed by benefit and tax laws. Contribution amounts are based on plan performance, interest rates, and pension funding legislation, among other factors. We currently expect to make a contribution of $6.4 million to our U.S. pension plan during 2019, in part to satisfy our requirements under the Pension Protection Act of 2006. We cannot predict whether changing conditions including interest rates, pension assets performance, discount rates, government regulation, or other factors will require us to make future contributions in excess of current expectations, or whether we will have the funds necessary to make minimum pension contributions at the times that they may be required. We maintain cash balances in foreign financial institutions. We maintain cash balances in foreign financial institutions. While we monitor the financial institutions that we maintain accounts with, we may not be able to recover our funds in the event that the financial institution would fail. In addition, we may be limited by foreign governments in the amount and timing of funds to be repatriated from foreign financial institutions. We carry a significant amount of goodwill on our balance sheet. As of November 30, 2018, we had goodwill of $70.9 million. The future occurrence of a potential indicator of impairment, such as a significant adverse change in business climate, an adverse action or assessment by a regulator, unanticipated competition, a material negative change in relationships with significant customers, strategic decisions made in response to economic or competitive conditions, loss of key personnel, or a more-likely-than-not expectation that a reporting unit or a significant portion of a reporting unit will be sold or disposed of, could result in goodwill impairment charges. We have recorded goodwill impairment charges in the past, and such charges materially affected our historical results of operations. For additional information, see Note A, Goodwill and Intangible Assets, to the accompanying consolidated financial statements. The market price for our common shares is particularly volatile. The market for our common shares is characterized by significant price volatility, and we expect that our share price will continue to be volatile. The trading of relatively small quantities of our common shares may cause disproportionate movements upwards and downwards in our share price due to our small market capitalization and low trading volume, and the cyclical nature of our business may create prolonged periods of higher or lower share prices not correlated to Company performance or to general economic or market conditions. Our substantial debt could adversely affect our financial health and prevent us from fulfilling our obligations. place us at a competitive disadvantage compared to our competitors that have less debt. Our ability to make scheduled payments on or to refinance our debt obligations and to fund planned capital expenditures and expansion efforts and any acquisitions we may make in the future depends on our ability to generate cash in the future and our financial condition and operating performance, which are subject to prevailing economic and competitive conditions and to certain financial, business and other factors beyond our control. We could be required to obtain the consent of the lenders under our term loan and our revolving credit facility to refinance material portions of our debt. We may not be able to maintain a level of cash flows from operating activities sufficient to permit us to pay the principal, premium, if any, and interest on our debt. realize from them, and these proceeds may not be adequate to meet any debt service obligations then due. Additionally, the agreements governing our term loan and our revolving credit facility will limit the use of the proceeds from any disposition; as a result, we may not be allowed, under these documents, to use proceeds from such dispositions to satisfy all current debt service obligations. Further, we may need to refinance all or a portion of our debt on or before maturity, and we cannot assure that we will be able to refinance any of our debt on commercially reasonable terms or at all. Despite ongoing actions to reduce our debt, we may still be required to incur significant additional debt. We may be able to incur substantial additional debt, including additional secured debt, in the future, and such additional debt may be necessary to accomplish some of our strategic objectives. The terms of the agreements governing our term loan and revolving credit facility restrict but do not completely prohibit us from incurring substantial additional debt. If new debt or other liabilities are added to our current debt levels, the related risks that we and our subsidiaries now face could intensify. The agreements governing our term loan and our revolving credit facility impose significant operating and financial restrictions on us, which may prevent us from capitalizing on business opportunities. Our term loan and revolving credit facility require us to meet certain financial covenants, including covenants relating to senior net debt leverage, minimum excess availability and a springing minimum fixed charge coverage ratio if average excess availability falls below a certain level. As a result of these covenants and restrictions, we may be limited in how we conduct our business and may be unable to raise additional debt or equity financing to compete effectively or to take advantage of new business opportunities. The terms of any future debt we may incur could include more restrictive covenants. We may not be able maintain compliance with these covenants in the future and, if we fail to do so, we may be unable to obtain waivers from the lenders and/or amend the covenants. Moreover, our revolving credit facility provides the lenders considerable discretion to impose reserves, which could materially impair the amount of borrowings that would otherwise be available to us. There can be no assurance that the lenders under our revolving credit facility will not impose such actions during the term of our revolving credit facility and further, were they to do so, the resulting impact of this action could materially and adversely impair our ability to make interest payments on our debt. If we default under our term loan or our revolving credit facility, we may not be able to service our debt obligations. In the event of a default under our term loan or our revolving credit facility, the lenders under each of these facilities could elect to declare all amounts borrowed, together with accrued and unpaid interest and other fees, to be due and payable. If such acceleration occurs, we may not be able to repay the amounts due under our term loan, or our revolving credit facility. This could have serious consequences to our financial condition, results of operations, cash flows and could cause us to become bankrupt or insolvent. Our subsidiaries may incur obligations that will constrain their ability to provide us with cash, which may affect our ability to make payments on our debt. Our cash flows and our ability to service our debt, including our ability to make interest and principal payments when due, are dependent upon cash dividends and other distributions or other transfers from our subsidiaries. Dividends, loans, and advances to us from our subsidiaries may be restricted by covenants in certain debt agreements. If our subsidiaries incur obligations with these restrictive covenants, it will constrain our subsidiaries' ability to provide us with cash, which may affect our ability to make payments on our debt. The LIBOR calculation method may change and LIBOR is expected to be phased out after 2021. The Company’s Term Loan B Credit Facility and its Senior Secured Credit Facility permit interest on the outstanding principal balance to be calculated based on LIBOR. On July 27, 2017, the U.K. Financial Conduct Authority (the "FCA") announced that it will no longer require banks to submit rates for the calculation of LIBOR after 2021. In the meantime, actions by the FCA, other regulators, or law enforcement agencies may result in changes to the method by which LIBOR is calculated. At this time, it is not possible to predict the effect of any such changes or any other reforms to LIBOR that may be enacted in the U.K. or elsewhere. For further discussion of our leased properties, please refer to Note M to the Consolidated Financial Statements of this report. From time to time, the Company is subject to various claims, proceedings and lawsuits related to products, services, contracts, employment, environmental, safety, intellectual property, and other matters. The ultimate resolution of such claims, proceedings, and lawsuits is inherently unpredictable and, as a result, the Company’s estimates of liability, if any, are subject to change. Actual results may materially differ from the Company’s estimates and an unfavorable resolution of any matter could have a material adverse effect on the business, operations, or financial condition of the Company. However, subject to the above and taking into account such amounts, if any, as are accrued from time to time on the Company’s consolidated balance sheet, the Company does not believe, based on the information currently available to it, that the ultimate resolution of these matters will have a material effect on the business, operations, or financial condition of the Company. The Company’s common shares are listed on the New York Stock Exchange and trade under the symbol OMN. At November 30, 2018, there were 5,440 holders of record of the Company’s common shares. Information regarding the high and low quarterly sales prices of the Company’s common share is contained in the Selected Quarterly Financial Data (Unaudited) and is incorporated herein by reference. The Company has not declared a dividend on its common shares since 2001. On September 25, 2018, the Company's Board of Directors authorized the repurchase of up to $20.0 million of the Company's common shares, which authorization expires upon the completion of $20.0 million in repurchases. The Company may use various methods to make the repurchases, including open market repurchases, negotiated block transactions, or open market solicitations for shares, all or some of which may be effected through Rule 10b5-1 plans. The timing of repurchases will depend upon several factors including market or business conditions, and repurchases may be discontinued at any time. The Company did not repurchase any of its common shares during the three months ended November 30, 2018. Information concerning long-term debt appears in Note K to the Consolidated Financial Statements and is incorporated herein by reference. Information concerning securities authorized for issuance under the Company’s equity compensation plans is set forth in Equity Compensation Plan Information of Item 12 in this Annual Report is incorporated herein by reference. 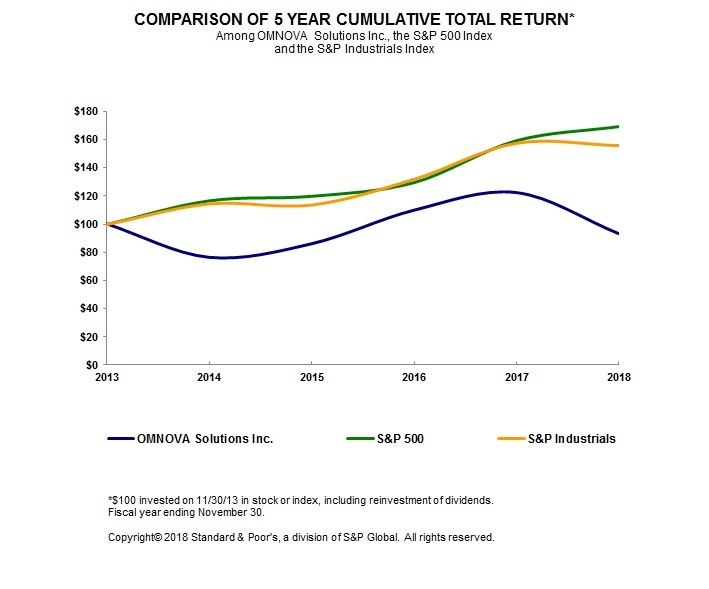 The graph below matches OMNOVA Solutions Inc.'s cumulative 5-Year total shareholder return on common stock with the cumulative total returns of the S&P 500 index and the S&P Industrials index. The graph tracks the performance of a $100 investment in our common share and in each index (with the reinvestment of all dividends) from November 30, 2013 to November 30, 2018. The following table sets forth the Company’s selected financial data for all periods presented. The selected financial data as of November 30, 2018, 2017, 2016, 2015, and 2014, and for each of the five years in the period ended November 30, 2018 are derived from the Company’s audited consolidated financial statements. See Management's Discussion and Analysis of Financial Condition and Results of Operations and Notes to Consolidated Financial Statements. OMNOVA Solutions is a global innovator of performance enhancing chemistries and surfaces for a variety of commercial, industrial, and residential end uses. Our products provide a variety of important functional and aesthetic benefits to hundreds of products that people use daily. We hold leading positions in key market categories, which have been built through innovative products, customized product solutions, strong technical expertise, well-established distribution channels, recognized brands, and long-standing customer relationships. We have strategically located manufacturing, technical and other facilities globally to service our broad customer base. Please refer to Item 1. Business, of this Annual Report on Form 10-K for further description of and background on the Company and its operating segments. The Company’s Chief Operating Decision Maker ("CODM"), its Chief Executive Officer ("CEO"), makes decisions, assesses performance, and allocates resources prospectively by reporting segment. Segment information has been prepared in accordance with guidance promulgated by the FASB. The Company has two reporting segments: "Specialty Solutions", a segment focused on the Company's higher growth specialty business lines, and "Performance Materials," a segment comprised of the Company's mature business lines. These reporting segments were determined based on products and services provided. Accounting policies of the segments are the same as those described in Note A—Description of Business and Significant Accounting Policies of the Company’s Consolidated Financial Statements. For a reconciliation of the Company’s segment operating performance information, refer to Note O of the Company’s Consolidated Financial Statements. Other key raw materials utilized by the Company include acrylites, polyvinyl chloride (PVC) resins, textiles, and plasticizers. These raw materials are generally available worldwide from several suppliers. OMNOVA had indexed sales price contracts covering approximately 25% of its sales in 2018. These contract indexes are generally comprised of several components: a negotiated fixed amount per pound, and the market price of key raw materials (i.e., styrene and butadiene). The indexed contracts provide that OMNOVA will pass through the increases or decreases of key raw materials, generally within a 30 to 60 day period. Indexed contracts vary in length, generally from 12 to 36 months. The majority of OMNOVA’s customers do not maintain indexed contracts. Instead, the Company negotiates pricing with each customer based on the cost of the raw materials components of the products being purchased and the value-added performance attributes of those products. The Company’s pricing objective, which may or may not be met, is to recover raw material price increases for these non-indexed contracts within three months. Key economic measures relevant to the Company include global economic growth rates, discretionary spending for durable goods, oil and gas consumption and drilling levels, U.S. commercial real estate occupancy rates, U.S. office furniture sales, manufactured housing shipments, housing starts and sales of existing homes, and forecasts of raw material pricing for certain petrochemical feed stocks. Key Original Equipment Manufacturer ("OEM") industries, which provide a general indication of demand drivers to the Company, include commercial and residential construction and refurbishment, automotive and tire production, furniture, flooring, and ABS manufacturing. These measures provide general information on trends relevant to the demand for the Company’s products, but the trend information does not necessarily directly correlate with demand levels in the markets which ultimately use the Company’s products in part because the Company's market share is relatively small in a number of specialty markets. Key operating measures utilized by the business segments include: orders; sales and pricing; working capital days; inventory; productivity; plant utilization; new product vitality; cost of quality; order fill-rates, which provide key indicators of business trends; and safety and other internal metrics. These measures are reported on various cycles including daily, weekly and monthly, depending on the needs established by operating management. Key financial measures utilized by Management to evaluate the results of its businesses and to understand the key variables impacting the current and future results of the Company include sales and pricing; gross profit; selling, general, and administrative expenses; adjusted operating profit; adjusted net income; consolidated earnings before interest, taxes, depreciation, and amortization (“EBITDA”) as set forth in the Net Leverage Ratio in the Company’s $350,000,000 Term Loan Credit Agreement; Adjusted EBITDA, working capital; operating cash flows; capital expenditures; cash interest expense; adjusted earnings per share; return on invested capital; and applicable ratios, such as inventory turnover; working capital turnover; return on sales and assets; and leverage ratios. These measures, as well as objectives established by the Company's Board of Directors, are reviewed at monthly, quarterly, and annual intervals and compared with historical periods. The Company's net sales in 2018 were $769.8 million, compared to $783.1 million in 2017. The acquisition of Resiquimica in September of 2018 accounted for $10.7 million of current year sales, while our former China-based coated fabric manufacturing operation, China Coated Fabrics ("CCF"), which was sold in July of 2017, accounted for $10.4 million in sales in 2017. Excluding the effect of CCF, sales decreased $2.9 million or 0.4%. The Specialty Solutions business segment revenue increased 10.5% and the Performance Materials business segment revenue decreased by 17.4%. Contributing to the net sales decrease of $2.9 million in 2018 were lower volume of $30.5 million, which was partially offset by favorable foreign exchange of $14.7 million and favorable price/mix of $2.5 million. Gross profit and gross profit margin in 2018 were $190.7 million and 24.8%, compared to $200.8 million and 25.6% in 2017. The decrease in gross profit margin resulted from lower volumes, primarily within Performance Materials. Volume decreased primarily due to the Company's continued strategic transition away from the commodity paper coatings market, and the sale of CCF, which were partially offset by improved volume in oil & gas, coatings and performance additives. Selling, general, and administrative expense in 2018 decreased $12.9 million or 10.9%, to $104.2 million, compared to $117.1 million in 2017. The decrease in 2018 reflects the One OMNOVA cost reduction initiatives, and reductions in outside services and incentive compensation. On December 22, 2017, U.S. federal tax legislation, commonly referred to as the Tax Cuts and Job Act (the “Tax Act”) was signed into law which, among other items: reduced the U.S. corporate income tax rate effective January 1, 2018 from 35% to 21%; repealed the Alternative Minimum Tax (“AMT”); imposed a one-time transition tax on accumulated foreign earnings not previously subject to U.S. taxation; provides a U.S. federal tax exemption on future distributions of foreign earnings; and beginning in fiscal 2019, creates a new minimum tax on certain foreign-sourced earnings. The U.S. corporate tax rate reduction resulted in a blended federal statutory tax rate of 22.2% for fiscal 2018 (based on 35% corporate rate through December 31, 2017 and 21% from that date through the end of fiscal 2018). The Securities and Exchange Commission Staff Accounting Bulletin No.118 (“SAB 118”), provides a measurement period that should not extend beyond one year from the Tax Act enactment date for companies to complete the accounting under ASC 740, Income Taxes. While the Company was able to make reasonable estimates of the items above, the ultimate impact may differ from these provisional amounts due to additional analysis, changes in interpretations and assumptions, additional regulatory guidance that may be issued and actions we may take as a result of the Tax Act. Adjustments to the provisional amounts recorded by the Company that are identified within a subsequent measurement period of up to one year from the enactment date will be included as an adjustment to income tax expense in the period the amounts are determined. Income tax benefit was $6.2 million in 2018, compared to income tax expense of $83.7 million in 2017. The 2018 income tax benefit was different than the statutory income tax rate primarily due to items related to the Tax Act. As a result of the Tax Act, the Company recorded a provisional net tax benefit of approximately $9.9 million, comprised of: a tax benefit of $4.1 million related to the re-measurement of the U.S. deferred taxes for the reduction of the U.S. federal corporate income tax rate; a tax benefit of $0.9 million associated with the reversal of the valuation allowance against the existing AMT credit carryforward as it is refundable under the Tax Act; and a tax benefit of $4.9 million associated with the reversal of the valuation allowance on a portion of the U.S. deferred tax assets as a result of deferred tax liabilities for indefinite lived intangible assets now considered available as a source of income as a result of the Tax Act. In addition, the Company recognized a $0.9 million income tax benefit related to the impact of a French tax rate change on the Company’s deferred tax liabilities. Based on recently enacted French tax legislation during the first quarter of 2018, the French tax rate will be reduced to 25.0% beginning in 2022 and the Company's deferred tax liabilities were reduced to appropriately reflect this legislation as a current period tax benefit. The 2017 income tax expense was higher than the statutory income tax rate of 35% primarily as a result of a $79.9 million income tax expense related to valuation allowances on deferred tax assets. Of that amount, $75.7 million income tax expense was recorded in the U.S. during the fourth quarter of 2017. Additionally, a $19.6 million goodwill impairment was recorded in the fourth quarter of 2017 for which no tax benefit was realized as the goodwill impairment is permanently non-deductible for tax purposes. The tax impact of the goodwill impairment was $6.9 million. These charges were partially offset by a $3.4 million income tax benefit from French legislative changes during the year. The following Segment Discussion presents information used by the Company in assessing the results of operations by business segment. The Company believes that this presentation is useful for providing the investor with an understanding of the Company’s business and operating performance because these measures are used by the CODM, its CEO, in making decisions, assessing performance and allocating resources. Specialty Solutions' net sales increased $46.2 million, or 10.5%, to $487.6 million in 2018, compared to $441.4 million in 2017. The acquisition of Resiquimica accounted for $10.7 million of the increase. The increased sales were primarily driven by improved volumes of $25.9 million, price/mix of $11.3 million, and favorable foreign exchange of $9.0 million. Volume was up in Specialty Coatings & Ingredients, Oil & Gas, and Laminates & Films. Net sales for the Specialty Coatings & Ingredients line increased $20.3 million to $251.6 million in 2018 compared to $231.3 million in 2017. Net sales for the Oil & Gas line increased $16.7 million to $71.3 million compared to $54.6 million in 2017. Net sales for the Laminates & Films line increased $9.2 million to $164.7 million in 2018 compared to $155.5 million in 2017. This segment generated an operating profit of $70.7 million in 2018, compared to $59.9 million in 2017. The increase in segment operating profit was due in part to increased volume, cost reduction initiatives, favorable foreign exchange, and improved price/mix, partially offset by higher raw material and operating costs. Segment operating profit includes items which Management excludes when evaluating the results of the Company' segments. Those items for 2018 totaled $3.7 million and included $1.8 million of acquisition and integration related expense, $1.2 million of asset impairment, facility closure and other costs, and $0.7 million of restructuring and severance charges. Those items for 2017 totaled $0.9 million and included $0.6 million of restructuring and severance charges and $0.3 million of operational improvement costs. Performance Materials' net sales decreased $59.5 million or 17.4% to $282.2 million in 2018, compared to $341.7 million in 2017. During 2017, the Company sold CCF which accounted for $10.4 million of net sales in 2017. The decrease of $59.5 million was driven primarily by lower volume of $46.0 million, the divestiture of CCF of $10.4 million, and unfavorable price/mix of $8.8 million, partially offset by favorable foreign exchange of $5.7 million. Volumes were down, primarily in Paper, due to the Company's exit of the commodity paper business. Net sales for Performance Additives increased $4.8 million to $106.0 million in 2018 compared to $101.2 million in 2017. Coated Fabrics' net sales decreased $10.9 million to $44.3 million in 2018, compared to $55.2 million in 2017, primarily due to the sale of CCF. Paper and Carpet net sales decreased $52.9 million to $113.6 million in 2018, compared to $166.5 million in 2017. Segment operating losses were $9.8 million in 2018, and $12.6 million in 2017. The segment operating loss in 2018 was primarily due to an asset impairment charge of $9.2 million related to the styrene-butadiene (SB) production transition from Green Bay, Wisconsin to Mogadore, Ohio, to offset the impact from lower volumes within the Company's commodity paper business. Segment operating profit includes items which Management excludes when evaluating the results of the Company's segments. Those items for 2018 totaled $16.7 million and include asset impairments, facility, and other costs of $14.3 million, accelerated depreciation of $1.1 million, restructuring and severance of $1.1 million and environmental charges of $0.2 million. Those items for 2017 totaled $33.3 million and include asset impairment charges and facility closure costs of $33.6 million, restructuring and severance costs of $1.7 million, and a reversal of an environmental charge of $2.0 million. Interest expense was $19.3 million and $21.5 million for 2018 and 2017, respectively. The decrease was primarily attributable to the $40.0 million Term Loan B prepayment made during the first quarter of fiscal 2018, resulting in a lower average outstanding debt balance in fiscal 2018 compared to fiscal 2017. Corporate expenses were $24.0 million in 2018, compared to $24.5 million in 2017. The decrease is primarily due to lower incentive compensation expense and outside service costs. The Company's net sales in 2017 were $783.1 million, compared to $759.9 million in 2016. CCF, which was sold in July of 2017, accounted for $10.4 million in sales in 2017 and $26.2 million in sales in 2016. Our India-based chemicals manufacturing operation, which was sold in February 2016, accounted for $3.4 million in sales in 2016. Excluding the effect of CCF and India, sales increased $42.4 million or 5.8%. The Specialty Solutions business segment revenue increased 9.2% and the Performance Materials business segment revenue decreased by 3.9%. Contributing to the net sales increase of $42.4 million in 2017 were improved customer pricing of $61.5 million, which was partially offset by unfavorable volume of $18.7 million and currency exchange of $0.4 million. The favorable pricing increase was primarily due to higher raw material costs and their related impact on pricing index formulas in certain markets of Performance Materials. The lower volume was driven primarily by market weakness in paper and antioxidants, which were only partially offset by improved volumes in laminates, nonwovens, and oil and gas. Gross profit and gross profit margin in 2017 were $200.8 million and 25.6%, compared to $203.9 million and 26.8% in 2016. The slightly lower gross profit margin was primarily due to unfavorable raw material costs, lower volumes, and slightly higher manufacturing costs as a result of manufacturing footprint initiatives, which were partially offset by favorable price and mix. Selling, general, and administrative expense in 2017 decreased $1.4 million to $117.1 million, compared to $118.5 million in 2016. The decrease in 2017 reflects savings from cost reduction programs implemented during the prior year along with reductions in outside services related to one-time project implementations, partially offset by a bad debt provision of $2.1 million. During the fourth quarter of 2017, one of the Company’s largest carpet customers was acquired by a competing carpet manufacturer. This customer had previously filed for bankruptcy reorganization, and due to the Company’s preferred supplier status, the Company continued to sell product to this customer and concluded that all past due amounts from the customer were likely to be collected. As a result of the eventual sale of the customer's business, in the fourth quarter of 2017, the Company was informed that its supply contract with the customer would not be renewed and therefore the Company was no longer considered a preferred supplier. Accordingly, the Company recorded a bad debt provision of $2.1 million, in the fourth quarter on 2017, as it now believes that a significant portion of the outstanding balance owed by this customer is unlikely to be collected. Income tax expense was $83.7 million in 2017, compared to an income tax expense of $10.3 million for 2016. The 2017 income tax expense was higher than the statutory income tax rate of 35% primarily as a result of a $79.9 million income tax expense related to valuation allowances on deferred tax assets. Of that amount, $75.7 million income tax expense was recorded in the U.S. during the fourth quarter of 2017. These valuation allowances are discussed in more detail under the heading "Significant Accounting Estimates and Management Judgments - F) Income Taxes". Additionally, a $19.6 million goodwill impairment was recorded in the fourth quarter of 2017 for which no tax benefit was realized as the goodwill impairment is permanently non-deductible for tax purposes. The tax impact of the goodwill impairment is $6.9 million. These expenses were partially offset by a $3.4 million income tax benefit from French legislative changes during the year. The 2016 effective tax rate was higher than the statutory income tax rate of 35% primarily as a result of a $2.2 million tax expense related to the payment of an intercompany dividend and a $1.6 million tax expense related to a newly enacted French deemed distribution tax. The French deemed distribution tax, enacted in 2016, was reversed in the first quarter of 2017 as the law was repealed in late December of 2016. A $1.8 million tax expense was also recorded for foreign valuation allowances on deferred tax assets in which no benefit is expected to be realized. In addition, the Company realized a $1.0 million tax benefit related to foreign taxes in jurisdictions in which the tax rate is lower than the U.S. federal statutory rate. Specialty Solutions' net sales increased $37.1 million to $441.4 million in 2017, compared to $404.3 million in 2016. The increased sales were primarily driven by improved customer pricing of $23.3 million, and favorable volume of $14.1 million, which were slightly offset by unfavorable currency translation effects of $0.3 million. Improved pricing was driven by higher contract-based index prices as a result of higher raw material costs. Volume was up in Laminates & Films, Oil & Gas, Nonwovens and EMOD but were partially offset by declines in Coatings, Home & Personal Care, and Construction. Net sales for the Specialty Coatings & Ingredients line increased $12.6 million to $231.3 million in 2017 compared to $218.7 million in 2016. Net sales for the Oil & Gas line increased $8.7 million to $54.6 million compared to $45.9 million in 2016. Net sales for the Laminates & Films line increased $15.9 million to $155.5 million in 2017 compared to $139.6 million in 2016. This segment generated an operating profit of $59.9 million in 2017, compared to $59.8 million in 2016. The slight increase in segment operating profit was due in part to effective cost reduction initiatives and favorable pricing, which offset higher raw material costs. In 2016, the segment's operating profit was impacted primarily by the segment wide restructuring initiative and the asset impairment charges. Management excludes these and other items when evaluating segment performance. Those items for 2017 totaled $0.9 million and included $0.6 million of restructuring and severance charges and $0.3 million of operational improvement costs. Those items for 2016 totaled $0.4 million and included facility closure costs of $1.5 million and $0.2 million of severance charges, partially offset by favorable adjustments of $1.3 million related to operational and other improvement items. The segment operating profit was also impacted by higher manufacturing costs, which were offset by margin expansion and and favorable mix. Performance Materials' net sales decreased $13.9 million to $341.7 million in 2017, compared to $355.6 million in 2016. During May 2017, the Company sold CCF which accounted for $10.4 million of net sales in 2017 and $26.2 million in 2016. In the first quarter of 2016 the Company sold its India operation which accounted for $3.4 million of net sales in 2016. Excluding these sold operations, net sales increased $5.2 million. The increase of $5.2 million was driven primarily by higher pricing of $38.2 million, which was primarily offset by lower volumes of $32.8 million, and unfavorable foreign currency translation effects of $0.1 million. Coated Fabrics' net sales decreased $16.3 million to $55.2 million in 2017 compared to $71.5 million in 2016, primarily due to the sale of CCF. Net sales for the Performance Additives decreased $6.0 million to $101.2 million in 2017 compared to $107.2 million in 2016, primarily due to decreased volumes. Paper and Carpet net sales increased $12.4 million to $166.5 million in 2017 compared to $154.1 million in 2016, primarily due to improved pricing for carpet. Segment operating loss was $12.6 million for 2017, compared to operating profit of $8.5 million for 2016. The decrease in segment operating profit was primarily due to a goodwill impairment charge of $19.6 million related to lower volumes within the paper market. Segment operating profit includes items which management excludes when evaluating the results of the Company's segments. Those items for 2017 totaled $13.7 million and include asset impairment charges and facility closure costs of $14.2 million, restructuring and severance costs of $1.7 million and a reversal of an environmental charge of $2.2 million. Those items for 2016 totaled $11.5 million and include acquisition and integration related expense, asset impairment charges of $5.7 million related to the sale of CCF, workforce reduction actions of $3.3 million, $3.0 million of accelerated depreciation expense, environmental costs of $0.3 million, and favorable adjustments of $1.9 million related to operational and other improvement items. amount of additional interest expense was less than the cost of the early redemption premium that the Company would have incurred by redeeming the Senior Notes in August 2016. Corporate expenses were $24.5 million in 2017, compared to $25.8 million in 2016. The decrease is due to cost reduction programs implemented during the prior year along with reductions in outside services related to one-time project implementations. During the third quarter of fiscal 2018, the Company announced its plan to close its styrene butadiene manufacturing facility in Green Bay, Wisconsin, moving production to our Mogadore, Ohio facility. The Company incurred $1.8 million of restructuring and severance expenses in fiscal 2018 related to this plan. Total estimated restructuring and severance costs for this plan are expected to be between $5.0 million to $8.0 million. As of November 30, 2018, $0.8 million was paid for this plan. The plan is expected to be completed no later than the third quarter of fiscal 2019. Restructuring and severance activities initiated in 2017 include the One OMNOVA initiative announced during the first quarter of 2017. The One OMNOVA initiative is focused on improving functional excellence in marketing, sales, operations, supply chain and technology, as well as various corporate functions. The plan is designed to reduce complexity and drive consistency across the global enterprise through a standardized, integrated business system. Total estimated costs for this initiative are expected to be between $5.0 million and $7.0 million. For this initiative, the Company has incurred costs of $5.2 million, of which $1.7 million was incurred in 2018, and $3.5 million in 2017. As of November 30, 2018, $5.1 million was paid for this plan. The plan was substantially completed at the end of 2018. Restructuring and severance activities initiated in 2016 included continued cost reduction and efficiency improvement actions, as well as a change in the Company’s CEO. For these activities, the Company has incurred and paid restructuring and severance costs of $7.6 million, including $2.1 million of costs recognized in 2017, and $5.5 million of costs recognized in 2016. As of November 30, 2018, the plan was considered complete. Cash provided by operating activities was $56.7 million in 2018, compared to $47.8 million in 2017 and $50.9 million in 2016. The $8.9 million increase in 2018 was primarily due to higher earnings after consideration of non-cash items and improved working capital. Working capital days improved to 46.8 days in 2018 compared to 56.5 days in 2017. The decrease in cash provided by operating activities in 2017 compared to 2016 was due to an increase in accounts receivable, which was driven by higher sales occurring later in the fourth quarter of 2017 compared to 2016. Cash used in investing activities was $46.0 million in 2018, compared to $28.6 million in 2017 and $20.3 million in 2016. The $17.4 million increase in 2018 was driven primarily by the acquisition of Resiquimica S.A. of $22.8 million. Included in 2017 are capital expenditures of $25.1 million, primarily related to manufacturing equipment, and acquisition and disposal of businesses of $7.3 million partially offset by the collection of a $3.8 million note receivable. Included in 2016 were capital expenditures of $25.6 million, primarily related to manufacturing equipment, partially offset by proceeds from the sale of the India operation. The Company expects capital expenditures of approximately $30.0 million to $35.0 million during 2019.
balance of $54.1 million at November 30, 2018 consists of $13.1 million in the U.S., $22.4 million in Europe, and $18.6 million in Asia. As of November 30, 2018, the Company is not aware of any restrictions regarding the repatriation of its non-U.S. cash. The Company believes that its cash flows from operations, together with existing credit facilities and cash on hand will be adequate to fund its cash requirements for at least the next twelve months. Information regarding the Company's debt is disclosed in Note K to the Company's consolidated financial statements. Includes principal and effective interest payments. Based on outstanding debt balances as of November 30, 2018 and estimated interest rates. As those are based on estimates, actual future payments may be different. Payments are based on Company estimates and current funding laws. As those are based on estimates, actual future payments may be different. The Company’s discussion and analysis of its results of operations, financial condition, and liquidity are based upon the Company’s consolidated financial statements as of November 30, 2018, which have been prepared in accordance with U.S. generally accepted accounting principles. The preparation of these consolidated financial statements requires the Company to make estimates and judgments that affect the reported amounts of assets and liabilities, revenues and expenses, and related disclosure of contingent assets and liabilities as of the date of the consolidated financial statements. Periodically, the Company reviews its estimates and judgments including those related to product returns, accounts receivable, inventories, litigation, environmental reserves, pensions, and income taxes. The Company bases its estimates and judgments on historical experience and on various assumptions that it believes to be reasonable under the circumstances. Actual results may materially differ from these estimates under different assumptions or conditions. The Company recognizes revenue when the following criteria are met: 1) persuasive evidence of an arrangement exists; 2) delivery has occurred; 3) an established sales price has been set with the customer; 4) collection of the sale revenue from the customer is reasonably assured; and 5) no contingencies exist. Delivery is considered to have occurred when the customer assumes the risk and rewards of ownership. The Company estimates and records provisions for customer quantity rebates and sales returns and allowances as reduction in revenue in the same period the related revenue is recognized, based upon its historical experience. The Company’s policy is to identify customers that are considered doubtful of collection based upon the customer’s financial condition, payment history, credit rating and other relevant factors; and reserves the portion of such accounts receivable for which collection does not appear likely. The allowance for doubtful accounts was $3.3 million and $2.9 million at November 30, 2018 and 2017, respectively. The Company’s policy is to maintain an inventory obsolescence reserve based upon specifically identified, discontinued, or obsolete items and a percentage of quantities on hand compared with historical and forecasted usage and sales levels. A sudden and unexpected change in design trends and/or material preferences could impact the carrying value of the Company’s inventory and require the Company to increase its reserve for obsolescence. The reserve for inventory obsolescence was $6.9 million and $6.4 million at November 30, 2018 and 2017, respectively. From time to time, the Company is subject to claims, lawsuits, and proceedings related to product liability, product warranty, contract, employment, environmental, and other matters. The Company provides a reserve for such matters when it concludes a material loss is probable and the amount can be estimated. Costs related to environmental compliance are also accrued when it is probable a loss has been incurred and the amount of loss can be estimated. The Company accounts for its pension and other post-retirement plans by recognizing in its balance sheet the overfunded or underfunded status of defined benefit post-retirement plans, measured as the difference between the fair value of plan assets and the benefit obligation (the projected benefit obligation for pension plans and the accumulated post-retirement benefit obligation for other post-retirement plans). The Company recognizes the change in the funded status of the plan in the year in which the change occurs through Accumulated Other Comprehensive (Loss) Income. As of May 2007, the Company's U.S. defined benefit pension plan have been closed to all new hires and since December 1, 2011, future service benefits were frozen and fully vested for all participants. Therefore, there is no future service benefit accrual for the Company’s U.S. defined benefit plans. The most significant elements in determining the Company’s pension expense are the expected return on plan assets and the discount rate. The assumed long-term rate of return on assets is applied to a calculated value of plan assets, which recognizes changes in the fair value of plan assets in a systematic manner over five years. This produces the expected return on plan assets that is included in pension (expense) income. For our U.S. plan, the difference between this expected return and the actual return on plan assets is deferred and amortized over the estimated remaining life expectancy of plan participants. The net deferral of past asset gains (losses) affects the calculated value of plan assets and, ultimately, future pension (expense) income. The Company recorded pension expense of $1.3 million in 2018 and $2.1 million in 2017. Pension expense is calculated using the discount rate to discount plan liabilities at the prior year measurement date. Discount rates of 3.66% and 4.12% were used to calculate the pension expense in 2018 and 2017, respectively. The Company anticipates 2019 expense to be approximately $2.0 million based on a weighted average discount rate of 4.41%. An increase or decrease of 25 basis points in the discount rate would decrease or increase expense on an annual basis by approximately $0.1 million. Cash contributions to the pension plans were $6.3 million in 2018 and $7.6 million in 2017. The Company, in consultation with its actuary, determined the discount rate used to discount the U.S. plan liabilities at the plan’s measurement date, which was November 30, 2018. The discount rate reflects the current rate at which the pension liabilities could be effectively settled at the end of the year. In determining the discount rate, we used spot rates on a yield curve matching benefit payments to determine the weighted average discount rate that would be applied in determining the benefit obligation at November 30, 2018. Changes in discount rates, as well as the net effect of other changes in actuarial assumptions and experience, have been recognized in Accumulated Other Comprehensive Income (Loss). The Company, in consultation with its actuary, determined the discount rate used to measure defined benefit pension plan obligations as of November 30, 2018 should be 4.41%, compared to 3.66% in 2017. A 25 basis point change in the discount rate would increase or decrease the projected benefit obligation by approximately $6.5 million. The Company utilizes an approach that discounts the individual expected cash flows underlying interest and service costs using the applicable spot rates derived from the yield curve used to determine the benefit obligation to the relevant projected cash flows. The spot rates used to determine service and interest costs for 2018 ranged from 1.92% to 4.08%. The ultimate spot rate used to discount cash flows beyond 30 years was 4.08% for 2018. The spot rates used to determine service and interest costs for 2019 expense ranged from 3.28% to 4.85%. The ultimate spot rate used to discount cash flows beyond 30 years was 4.83% for 2019. The use of disaggregated discount rates results in a different amount of Interest Cost compared to the traditional single weighted-average discount rate approach because of different weightings given to each subset of payments. The use of disaggregated discount rates affects the amount of Service Cost because the benefit payments associated with new service credits for active employees tend to be of longer duration than the overall benefit payments associated with the plan’s benefit obligation. As a result, the payments would be associated with longer-term spot rates on the yield curve, resulting in lower present values than the calculations using the traditional single weighted-average discount rate. The Company uses the Mercer modified version (MRP - 2007) of the Society of Actuaries’ (SOA) RP-2014 mortality table for the pre-retirement mortality base table. The Company also uses the Mercer Industry Longevity Experience Study (MILES) table for the Chemical, Oil & Gas and Utilities industry and the Consumer Goods and Food & Drink industry for the post-retirement mortality base table. To develop the expected long-term rate of return on assets assumption, the Company, in consultation with its actuary, considered the historical returns and the future expectations for returns for each asset class, as well as the target allocation of the pension portfolio. This resulted in the selection of a long-term rate of return on assets assumption of 7.68% for both 2018 and 2017. The measurement dates of November 30, 2018 and 2017 were used to determine these rates. A 25 basis point change in the assumed rate of return for assets would increase or decrease pension expense by approximately $0.5 million. Pension plan assets are measured at fair value or at Net Asset Value ("NAV") for certain collective trusts on the measurement date. Based on current estimates of pension asset performance, interest and discount rate assumptions, the Company expects it will be required to make a cash contributions to its pension plans of $6.4 million in 2019. Opportunities to reduce future cash requirements by accelerating contributions ahead of the minimum required schedule. Voluntary contributions in excess of minimally required amounts may prevent the need for larger contributions in the future. determined based on the difference between the financial reporting and tax bases of assets and liabilities using the enacted tax rates that will be in effect in the period the differences are expected to reverse. The Company records a valuation allowance to offset deferred tax assets, if based on the weight of all available positive and negative evidence, it is more-likely-than-not that some portion, or all, of the deferred tax assets will not be realized. Changes in tax laws and rates may affect recorded deferred tax assets and liabilities along with our effective tax rate in the future. A high degree of judgment is required to determine the extent a valuation allowance should be provided against deferred tax assets. On a quarterly basis, the Company assesses the likelihood of realization of its deferred tax assets considering all available evidence, both positive and negative. In determining whether a valuation allowance is warranted, the Company evaluates factors such as prior earnings history, expected future earnings, carry-back and carry-forward periods and tax strategies that could potentially enhance the likelihood of the realization of a deferred tax asset. The weight given to the positive and negative evidence is commensurate with the extent to which the evidence may be objectively verified. It is generally difficult to outweigh objectively verifiable negative evidence of cumulative financial reporting losses. As a result of historical restructuring charges and impairments over the last few years, including a significant goodwill impairments recorded in the fourth quarter of 2017, the Company entered into a U.S. jurisdiction three-year cumulative loss position for the three year period ending November 2017. The Company considered sources of positive evidence, including the Company’s year over year growth in its core earnings, expected future earnings, which if realized would enable the Company to utilize its net operating loss carryforwards, and a recent history of net operating loss utilization. A cumulative loss position is considered significant negative evidence in assessing the realizability of a deferred tax asset that is difficult to overcome when determining whether a valuation allowance is required. Based on the weight of all available positive and negative evidence, the Company established a valuation allowance of $73.1 million in the fourth quarter of 2017 on its U.S. deferred tax assets. In addition, a $3.3 million valuation allowance was established on a capital loss incurred in the U.S. on the stock sale of a foreign subsidiary during the third quarter of 2017. For the three year period ended November 2018, the U.S. jurisdiction remains in a three-year cumulative loss position. Considering the weight of available positive and negative evidence, the Company does not believe the positive evidence (some of which is subjective) overcomes the negative objective evidence of a 3-year cumulative loss position. Therefore, the Company concludes that the valuation allowance should remain on its U.S. deferred tax assets as of November 30, 2018. The Company has not provided for U.S. income taxes on undistributed earnings on certain of its non-U.S. subsidiaries as such amounts are considered permanently reinvested outside the U.S. As a result of the Tax Act, to the extent that foreign earnings previously treated as permanently reinvested are repatriated, the related U.S. tax liability primarily attributable to withholding taxes may be creditable. However, based on the Company's policy of permanent reinvestment, it is not practicable to determine the U.S. federal income tax liability, if any, which would be payable if such earnings were not permanently reinvested. As of November 30, 2018, the non-U.S. subsidiaries have cumulative foreign retained earnings of $60.6 million. The Company utilizes a recognition threshold and measurement attribute for the financial statement recognition and measurement of an income tax position taken or expected to be taken in an income tax return. For those benefits to be recognized, an income tax position must be more-likely-than-not to be sustained upon examination by taxing authorities. The amount recognized is measured as the largest amount of benefit that is more-likely-than-not of being realized upon ultimate settlement. penalties in income tax expense. For 2018, the Company recognized minimal income tax expense related to interest and penalties. On December 22, 2017, U.S. federal tax legislation, commonly referred to as the Tax Cuts and Job Act (the “Tax Act”) was signed into law which, among other changes: reduced the U.S. corporate income tax rate effective January 1, 2018 from 35% to 21%; repealed the Alternative Minimum Tax (“AMT”); imposed a one-time transition tax on accumulated foreign earnings not previously subject to U.S. taxation; provides a U.S. federal tax exemption on future distributions of foreign earnings; and beginning in fiscal 2019, creates a new minimum tax on certain foreign-sourced earnings. The U.S. corporate tax rate reduction resulted in a blended federal statutory tax rate of 22.2% for fiscal 2018 (based on 35% corporate rate through December 31, 2017 and 21% from that date through the end of fiscal 2018). The Securities and Exchange Commission Staff Accounting Bulletin No.118 (“SAB 118”), provides a measurement period that should not extend beyond one year from the Tax Act enactment date for companies to complete the accounting under ASC 740, Income Taxes. While the Company was able to make reasonable estimates of the items above, the ultimate impact may differ from these provisional amounts due to additional analysis, changes in interpretations and assumptions, additional regulatory guidance that may be issued and actions we may take as a result of the Tax Act. Adjustments to the provisional amounts recorded by the Company that are identified within a subsequent measurement period of up to one year from the enactment date will be included as an adjustment to income tax expense in the period the amounts are determined. The Company uses the fair value method of accounting to record share-based compensation based on the grant date fair value. While the Company regularly evaluates the use of share-based compensation, its practice has been to issue restricted shares or restricted share units, which are required to be expensed using the fair value method. Beginning with grants in 2018, the Company determined that its Performance Share Units ("PSU's") would vest and be paid in OMNOVA common shares. The fair value of PSU's, Restricted Share Awards ("RSA's") and Restricted Share Units ("RSU's") is determined based on the closing market price of the Company’s common shares at the date of grant. Refer to Note N to the Company’s Consolidated Financial Statements for further discussion of share-based compensation. Long-lived assets, such as property, plant, and equipment, and finite-lived intangibles are stated at historical cost less accumulated depreciation and amortization. Construction in process ("CIP") is not depreciated until the asset is placed in service. Refurbishment costs that extend the useful life of the asset are capitalized, whereas ordinary maintenance and repair costs are expensed as incurred. Interest expense incurred during the construction phase is capitalized as part of CIP until the relevant projects are completed and placed into service. Long-lived assets are reviewed for impairment whenever events or changes in circumstances indicate that the carrying amount of an asset may not be recoverable. Recoverability of assets to be held and used is measured by comparing the carrying amount of an asset to the estimated undiscounted future cash flows expected to be generated by the asset. If the carrying amount of an asset exceeds its estimated future cash flows, an impairment charge is recognized in the amount by which the carrying amount of the asset exceeds the estimated fair value of the asset. Assets to be disposed of are reported at the lower of the carrying amount or the estimated disposal price less costs to sell. Depreciation ceases for assets meeting the held-for-sale criteria. During 2018, the Company's Board of Directors approved a plan to close the Green Bay, Wisconsin plant shifting styrene butadiene manufacturing to its production plant in Mogadore, Ohio. As a result, the Company determined that certain plant and equipment were impaired and recognized an impairment charge of $9.2 million, primarily in the Performance Materials segment, to write-down the asset group to fair value based on the market approach analysis. Also during 2018, the Company recognized other asset impairment charges of $2.7 million related to idled assets. During the fourth quarter of 2017, due to anticipated lower volumes in the paper market, the Company performed an impairment analysis of the related asset group. Based on this analysis, it was determined that the fair value of the asset group was in excess of the book value, and accordingly, the Company concluded no impairment was necessary. During the fourth quarter of 2016, due to changes in markets and expected lower capacity utilization at the CCF facility, the Company performed an impairment analysis of this asset group. Based on this analysis, it was determined that the fair value of the asset group was less than book value, and accordingly, the Company recognized an impairment charge of $5.4 million and reduced Property, Plant, and Equipment by $5.2 million and intangible assets by $0.2 million. The CCF facility also recognized $0.3 million of impairment charges during the first quarter of 2016 related to equipment. Additionally, during the second quarter of 2017, in connect with the pending sale of the CCF operations, the Company further recognized an additional impairment charge of $12.8 million to write down the asset group to the contract sale price which approximated fair value. Goodwill represents the excess of the purchase price over the fair value of assets acquired and liabilities assumed in a business combination. Goodwill and other indefinite lived intangible assets are tested for impairment at least annually as of September 1, and whenever events or circumstances indicate that the carrying amount may not be recoverable. The Company performs the impairment analysis at the reporting unit level using a two-step impairment test. The first step identifies potential impairments by comparing the estimated fair value of a reporting unit with its carrying value. Fair value is typically estimated using a market approach method or a discounted cash flow analysis based on level 3 inputs in the fair value hierarchy, which requires the Company to estimate future cash flows anticipated to be generated by the reporting unit, as well as a discount rate to measure the present value of the anticipated cash flows. If the estimated fair value of a reporting unit exceeds its carrying value, goodwill is not considered impaired and the second step is not necessary. If the carrying value of a reporting unit exceeds the estimated fair value, the second step calculates the possible impairment by comparing the implied fair value of goodwill with the carrying value. If the implied fair value of goodwill is less than the carrying value, an impairment charge is recognized. The impairment test for indefinite lived intangible assets consists of comparing the fair value of the asset with its carrying value. The Company estimates the fair value of its indefinite lived intangible assets using a fair value model based on a market approach method or discounted future cash flows. If the carrying amounts exceed the estimated fair value, an impairment loss would be recognized in the amount of the excess. Key inputs used in determining the fair value of the trademarks/tradenames were expected future revenues and royalty rates, and accordingly, their fair value is impacted by selling prices, which for the Company is based in part on raw material costs. As of September 1, 2018, the Company performed its annual impairment test for indefinite lived intangible assets and determined that there was one tradename associated with Performance Materials that was impaired by $1.5 million and as a result, the carrying value equals the fair value of this tradename as of the annual impairment testing date. A sensitivity analysis was performed by the Company on this tradename and a hypothetical 100 basis point increase in the discount rate used to value this tradename would result in additional impairment of $0.3 million. Trademarks and tradenames continue to be important to the Company, and we continue to focus on long-term growth, however, if recent trends continue, the long-term assumptions relative to growth rates and profitability of the trademarks and tradenames may not be attained, which could result in additional impairment to one or more of the Company's trademarks and tradenames. Estimating future cash flows requires significant judgments and assumptions by Management including sales, operating margins, royalty rates, discount rates, and future economic conditions. To the extent that the reporting unit is unable to achieve these assumptions, impairment losses may occur. Finite lived intangible assets, such as customer lists, patents, certain trademarks/tradenames, and licenses, are recorded at cost or estimated fair value when acquired as part of a business combination. Intangible assets with finite lived are amortized over their estimated useful lives with periods ranging from 3 to 53 years. The financial position and results of operations of the Company’s foreign subsidiaries are measured using the local currency as the functional currency. Assets and liabilities of operations denominated in foreign currencies are translated into U.S. dollars at exchange rates in effect at the balance sheet date, while revenues and expenses are translated at the weighted average exchange rates each month during the year. The resulting translation gains and losses on assets and liabilities are recorded in Accumulated Other Comprehensive Income (Loss), and are excluded from net income until realized through a sale or liquidation of the investment. Operating lease expenses are recorded on a straight-line basis over the non-cancelable lease term, including any optional renewal terms that are reasonably expected to be exercised. Leasehold improvements related to these operating leases are amortized over the estimated useful life or the non-cancelable lease term, whichever is shorter. Capital leases are recorded at the lower of fair market value or the present value of future minimum lease payments with a corresponding amount recorded in property, plant, and equipment. Current portions of capital lease payments are included in Amounts due banks and non-current capital lease obligations are included in Long-term debt in our Consolidated Balance Sheets. The Company’s policy is to conduct its businesses with due regard for the preservation and protection of the environment. The Company devotes significant resources and Management attention to comply with environmental laws and regulations. The Company’s Consolidated Balance Sheets as of November 30, 2018 and 2017 reflects reserves for environmental remediation efforts of $1.5 million and $1.6 million, respectively. Capital expenditures for projects related to environmental matters were $1.0 million in 2018, $1.0 million in 2017, and $1.1 million in 2016. During 2018, non-capital expenditures for environmental compliance and protection totaled $10.0 million, all of which were for recurring costs associated with managing hazardous substances and pollution abatement in ongoing operations. Similar non-capital expenditures were $8.8 million and $6.5 million in years 2017 and 2016, respectively. The Company anticipates that non-capital environmental expenditures for the next several years will be consistent with 2018 expenditure levels. New accounting pronouncements impacting the Company are disclosed in Note A to the Company’s consolidated financial statements. This Annual Report includes forward looking statements as defined by federal securities laws. Please refer to Item 1A. Risk Factors of this Report, which is incorporated herein by reference. The Company is exposed to market risk from changes in interest rates on its long-term debt obligations. As described in Note K to the Consolidated Financial Statements, the Company’s Term Loan B, Senior Secured Revolving Credit Facility, and Eurodollar Revolving Loan bears interest at variable rates. The Company has $314.1 million of variable rate debt as of November 30, 2018. The weighted average effective interest rate of the Company’s outstanding debt was 5.33% for 2018. A hypothetical increase of 100 basis points would impact the Company’s interest expense on its variable rate debt by approximately $3.1 million annually. The Company is subject to foreign currency exchange rate risk. The Company has accumulated currency translation losses of $32.6 million as of November 30, 2018, which is included in accumulated other comprehensive income (loss). The Company does not enter into derivatives or other financial instruments for trading or speculative purposes. Management of OMNOVA Solutions Inc. is responsible for establishing and maintaining adequate internal control over financial reporting, as such term is defined in Exchange Act Rules 13a-15(f). In evaluating the Company’s internal control over financial reporting, Management has adopted the framework in Internal Control—Integrated Framework issued by the Committee of Sponsoring Organizations of the Treadway Commission (2013 framework). Under the supervision and with the participation of the Company’s Management, including the Chief Executive Officer and Chief Financial Officer, the Company conducted an assessment of the effectiveness of the Company’s internal control over financial reporting. Management has determined that the Company’s internal control over financial reporting is effective as of November 30, 2018. On September 25, 2018, the Company acquired all of the outstanding shares of Resiquimica S.A. and certain related entities ("Resiquimica") from Socer - Imobiliaria e Investimentos, S.A. As permitted by the Securities and Exchange Commission, management excluded the Resiquimica operations from its assessment of internal control over financial reporting as of November 30, 2018. Resiquimica operations constituted 1% of total sales and net income and 8% of total assets. Resiquimica operations will be included in the Company's assessment of internal control over financial reporting as of November 30, 2019. The effectiveness of the Company’s internal control over financial reporting as of November 30, 2018 has been audited by Ernst & Young LLP, an independent registered public accounting firm, as stated in its report, which is included herein. To the Shareholders and the Board of Directors of OMNOVA Solutions Inc.
We have audited OMNOVA Solutions Inc.’s internal control over financial reporting as of November 30, 2018, based on criteria established in Internal Control-Integrated Framework issued by the Committee of Sponsoring Organizations of the Treadway Commission (2013 framework) (the COSO criteria). In our opinion, OMNOVA Solutions Inc. ("the Company") maintained, in all material respects, effective internal control over financial reporting as of November 30, 2018, based on the COSO criteria. As indicated in the accompanying Management’s Assessment of Internal Control Over Financial Reporting, management’s assessment of and conclusion on the effectiveness of internal control over financial reporting did not include the internal controls of Resiquimica S.A. and certain related entities (“Resiquimica”), which is included in the 2018 consolidated financial statements of the Company and constituted 8% of total assets as of November 30, 2018 and 1% of net sales and net income for the year then ended. Our audit of internal control over financial reporting of the Company also did not include an evaluation of the internal control over financial reporting of Resiquimica. We also have audited, in accordance with the standards of the Public Company Accounting Oversight Board (United States) (PCAOB), the consolidated balance sheets of the Company as of November 30, 2018 and 2017, and the related consolidated statements of operations, comprehensive income (loss), shareholders’ equity and cash flows for each of the three years in the period ended November 30, 2018, and the related notes and our report dated January 31, 2019 expressed an unqualified opinion thereon. The Company’s management is responsible for maintaining effective internal control over financial reporting and for its assessment of the effectiveness of internal control over financial reporting included in the accompanying Management’s Assessment of Internal Control Over Financial Reporting. Our responsibility is to express an opinion on the Company’s internal control over financial reporting based on our audit. We are a public accounting firm registered with the PCAOB and are required to be independent with respect to the Company in accordance with the U.S. federal securities laws and the applicable rules and regulations of the Securities and Exchange Commission and the PCAOB. Management of OMNOVA Solutions Inc. is responsible for preparing the accompanying consolidated financial statements and for assuring their integrity and objectivity. These financial statements were prepared in accordance with U.S. generally accepted accounting principles and fairly represent the transactions and financial condition of the Company in all material respects. The financial statements include amounts that are based on management’s best estimates and judgments. The Company’s financial statements have been audited by Ernst & Young LLP, an independent registered public accounting firm that has been selected and approved by the Audit Committee of the Board of Directors and ratified by the shareholders. Management has made available to Ernst & Young LLP all of the Company’s financial records and related data, internal audit reports, as well as the minutes of shareholders’ and directors’ meetings. Management of the Company has established and maintains a system of internal controls over financial reporting that is designed to provide reasonable assurance that assets are safeguarded, transactions are properly recorded and executed in accordance with management’s authorization and the books and records accurately reflect the disposition of assets. The system of internal controls includes appropriate division of responsibility. The Company maintains an internal audit function that independently assesses the effectiveness of the internal controls through a program of internal audits. The Audit Committee is composed of directors who are not officers or employees of the Company. It meets regularly with members of Management, the internal auditors, and representatives of the independent registered public accounting firm to discuss the adequacy of the Company’s internal control over financial reporting, financial statements, and the nature, extent, and results of the audit effort. Management reviews with the Audit Committee all of the Company’s significant accounting policies and assumptions affecting the results of operations. Both the independent registered public accounting firm and internal auditors have access to the Audit Committee without the presence of Management. We have audited the accompanying consolidated balance sheets of OMNOVA Solutions Inc. ("the Company") as of November 30, 2018 and 2017, and the related consolidated statements of operations, comprehensive income (loss), shareholders’ equity and cash flows for each of the three years in the period ended November 30, 2018, and the related notes (collectively referred to as the “consolidated financial statements”). In our opinion, the consolidated financial statements present fairly, in all material respects, the financial position of the Company at November 30, 2018 and 2017, and the results of its operations and its cash flows for each of the three years in the period ended November 30, 2018, in conformity with U.S. generally accepted accounting principles. We also have audited, in accordance with the standards of the Public Company Accounting Oversight Board (United States) (PCAOB), the Company’s internal control over financial reporting as of November 30, 2018, based on criteria established in Internal Control-Integrated Framework issued by the Committee of Sponsoring Organizations of the Treadway Commission (2013 framework) and our report dated January 31, 2019 expressed an unqualified opinion thereon. We have served as the Company's auditor since 1999. Description of Business - The Company is a global innovator of performance enhancing chemistries and surfaces for a variety of commercial, industrial and residential end uses. The Company's products provide a variety of important functional and aesthetic benefits to hundreds of products that people use daily. The Company holds leading positions in key market categories, which have been built through innovative products, customized product solutions, strong technical expertise, well-established distribution channels, recognized brands, and long-standing customer relationships. The Company utilizes strategically-located manufacturing, technical and other facilities in North America, Europe, China, and Thailand to service the broad customer base. The Company has two business segments: Specialty Solutions, which is focused on the Company's higher growth specialty businesses, and Performance Materials, which is focused on the Company’s more mature businesses. Specialty Solutions - The Specialty Solutions segment consists of three business lines: Specialty Coatings & Ingredients, Oil & Gas, and Laminates & Films. The Specialty Solutions segment develops, designs, produces, and markets a broad line of specialty products for use in coatings, adhesives, sealants, elastomers, laminates, films, nonwovens, and oil & gas products. These products are used in numerous applications, including architectural and industrial coatings; nonwovens used in hygiene products, filtration and construction; drilling additives for oil and gas drilling, cementing and fracking; elastomeric modification of plastic casings and hoses used in household and industrial products and automobiles; tapes and adhesives; sports surfaces; textile finishes; commercial building refurbishment; new construction; residential cabinets; flooring; ceiling tile; furnishings; manufactured housing; health care patient and common area furniture; and a variety of industrial films applications. The segment's products improve the performance of customers’ products, including stain, rust and aging resistance; surface modification; gloss; softness or hardness; dimensional stability; high heat and pressure tolerance; and binding and barrier (e.g. moisture, oil) properties. Performance Materials - The Performance Materials segment serves mature markets including plastics, Paper, Carpet and Coated Fabrics with a broad range of polymers based primarily on styrene butadiene (SB), styrene butadiene acrylonitrile (SBA), styrene butadiene vinyl pyridine, high styrene pigments, polyvinyl acetate, acrylic, styrene acrylic, calcium stearate, glyoxal, and bio-based chemistries. Performance Materials' custom-formulated products are tailored latexes, resins, binders, antioxidants, hollow plastic pigment, coated fabrics, and rubber reinforcing which are used in tire cord, polymer stabilization, industrial rubbers, carpet, paper, and various other applications. Its products provide a variety of functional properties to enhance the Company’s customers’ products, including greater strength, adhesion, dimensional stability, ultraviolet resistance, improved processibility, and enhanced appearance. Basis of Presentation - The consolidated financial statements have been prepared in accordance with U.S. generally accepted accounting principles and include the accounts of the Company and its wholly owned subsidiaries. All intercompany balances have been eliminated. Use of Estimates - The preparation of the consolidated financial statements in conformity with U.S. generally accepted accounting principles requires Management to make estimates and assumptions that affect the amounts reported in the consolidated financial statements and accompanying notes. Actual results could differ from those estimates. Revenue Recognition - The Company recognizes revenue when the following criteria are met: 1) persuasive evidence of an arrangement exists; 2) delivery has occurred; 3) an established sales price has been set with the customer; 4) collection of the sale revenue from the customer is reasonably assured; and 5) no contingencies exist. Delivery is considered to have occurred when the customer assumes the risk and rewards of ownership. The Company estimates and records provisions for customer quantity rebates and sales returns and allowances as a reduction in revenue in the same period the related revenue is recognized, based upon its historical experience. Environmental Costs - The Company recognizes costs associated with managing hazardous substances and pollution in ongoing operations as incurred. The Company accrues for costs, on an undiscounted basis, associated with environmental remediation when it becomes probable that a liability has been incurred and the amount is estimable. Research and Development Expense - Research and development costs were $17.7 million in 2018, $18.9 million in 2017, and $20.8 million in 2016. Our research and development costs relating to new products amounted to $6.1 million in 2018, $7.5 million in 2017, and $8.2 million in 2016, are charged to expense as incurred. Cash and Cash Equivalents - The Company considers all highly liquid instruments with original maturities of 90 days or less as cash equivalents. Financial Instruments and Fair Value Measurements - Financial assets and financial liabilities carried on the balance sheet include cash and deposits at financial institutions, trade receivables and payables, capital lease obligations, other receivables and payables, borrowings, and derivative instruments. The accounting policies on recognition and measurement of these items are disclosed elsewhere in these consolidated financial statements. Fair value is the price that would be received to sell an asset or the price paid to transfer a liability in an orderly transaction between market participants at the measurement date. Level 1 inputs—Quoted market prices in active markets for identical assets or liabilities. Level 2 inputs—Observable market based inputs or unobservable inputs that are corroborated by market data. Level 3 inputs—Unobservable inputs that are not corroborated by market data. Financial Risk—The Company is mainly exposed to credit, interest rate, and currency exchange rate risks which arise in the normal course of business. See Note P for further discussion on these risks. a cash flow hedge, or a hedge of a net investment in a foreign operation based on the characteristics of the underlying contract. The Company does not use fair value or net investment hedges. For a cash flow hedge, the fair value of the effective portion of the derivative is recognized as an asset or liability with a corresponding amount in Accumulated Other Comprehensive Loss. Amounts in Accumulated Other Comprehensive Income (Loss) are recognized in earnings when the underlying hedged transaction affects earnings. Ineffectiveness is measured by comparing the present value of the cumulative change in the expected future cash flows of the derivative and the present value of the cumulative change in the expected future cash flows of the related instrument. Any ineffective portion of a cash flow hedge is recognized in earnings immediately. For derivative instruments not designated as hedges, the change in fair value of the derivative is recognized in earnings each reporting period. The Company discontinues hedge accounting prospectively when it is determined that the derivative is no longer effective in offsetting changes in the cash flows of the hedged item or Management determines that designation of the derivative as a hedging instrument is no longer appropriate. Any prospective gains or losses in this scenario on the derivative would be recognized in earnings. Foreign currency exchange contracts are used by the Company to manage risks from the change in exchange rates on cash payments between the Company's foreign subsidiaries. These forward contracts are used on a continuing basis for periods of less than one year, however these are not designated as cash flow hedges, consistent with the underlying hedged transactions. The hedging limits the impact of foreign exchange rate movements on the Company’s operating results. As of November 30, 2018, the notional amount of outstanding forward contracts was $16.5 million with a fair value of $0.1 million. As of November 30, 2017, the notional amount of outstanding forward contracts was $9.8 million with a fair value of $0.1 million. The Company does not enter into derivative instruments for trading or speculative purposes. Accounts Receivable Allowance - The Company’s policy is to identify customers that are considered doubtful of collection based upon the customer’s financial condition, payment history, credit rating and other relevant factors; and reserves the portion of such accounts receivable for which collection does not appear likely. The allowance for doubtful accounts was $3.3 million and $2.9 million at November 30, 2018 and 2017, respectively. The Company does not charge interest to its customers on past due accounts receivable. Inventories - Inventories valued using the last-in, first out ("LIFO") cost method are stated at lower of cost or market. All other Inventories are stated at the lower of cost or net realizable value. All U.S. produced inventory, which represents 46% of total inventory, is valued using the LIFO method. The remaining portions of inventories, which are located outside of the U.S., are valued using the first-in, first-out ("FIFO") or an average cost method. Inventory costs include direct overhead, freight, and duty. Notes Receivable - Notes receivable accepted by the Company are initially recognized at fair value. The Company does not subsequently adjust the fair value of these notes receivable unless it is determined that the note receivable is impaired. The Company considers the issuer's financial condition, payment history, credit rating, and other relevant factors when assessing the collectability of the note and to reserve the portion of such note for which collection does not appear likely. Interest income is recognized as earned. Litigation - From time to time, the Company is subject to claims, lawsuits, and proceedings related to product liability, product warranty, contract, employment, environmental, and other matters. The Company provides a reserve for such matters when it concludes a material loss is probable and the amount can be estimated. Deferred Financing Fees - Debt issuance costs are capitalized as a reduction to the carrying value of the liability and amortized over the life of the related debt. Deferred financing fee amortization is included in interest expense in the consolidated statements of operations. Property, Plant, and Equipment - Property, plant, and equipment are initially recorded at cost. Construction in process is not depreciated until the asset is ready for its intended use and is placed into service. Refurbishment costs that extend the useful life of the asset are capitalized, whereas ordinary maintenance and repair costs are expensed as incurred. Interest expense incurred during the construction phase is capitalized as part of construction in process until the relevant projects are completed and placed into service. Leasehold improvements are depreciated over the shorter of the lease term, including any expected renewal periods that are probable to occur, or the estimated useful life of the improvement. All of the Company’s long-lived assets are reviewed for impairment whenever events or circumstances indicate that the carrying amount may not be recoverable. If the sum of undiscounted expected future cash flows is less than the carrying amount of the asset or asset group, an impairment loss is recognized based on the difference between the estimated fair value of the asset or asset group and its carrying value. For further discussion on long-lived asset impairments, see Note C.
When specific actions to dispose of an asset or group of assets meet certain criteria, the underlying assets and liabilities are adjusted to the lesser of carrying value or fair value and, if material, they are reclassified into a “held for sale” category in the consolidated balance sheet or they are condensed and reported in other assets and liabilities. Goodwill and Intangible Assets - Goodwill represents the excess of the purchase price over the fair value of assets acquired and liabilities assumed in a business combination. Goodwill and other indefinite lived intangible assets are tested for impairment at least annually as of September 1, and whenever events or circumstances indicate that the carrying amount may not be recoverable. The Company performs the impairment analysis at the reporting unit level. The Company identifies potential impairments by comparing the estimated fair value of a reporting unit with its carrying value. Fair value is typically estimated using a market approach method or a discounted cash flow analysis based on level 3 inputs in the fair value hierarchy, which requires the Company to estimate future cash flows anticipated to be generated by the reporting unit, as well as a discount rate to measure the present value of the anticipated cash flows. If the estimated fair value of a reporting unit exceeds its carrying value, goodwill is not considered impaired. If the carrying value of a reporting unit exceeds the estimated fair value, an impairment charge is recognized as the difference between the estimated fair value and the carrying value. As a result of the Company's annual goodwill impairment test during the fourth quarter of 2018, no impairment charges were required. As part of its 2017 segment realignment, the Company allocated existing goodwill between two of its four reporting units based on their relative fair values. As a result, $60.6 million of goodwill was allocated to the Specialty Solutions segment and $19.6 million of goodwill was allocated to the Performance Materials segment. Prior to the segment realignment, all goodwill had been allocated to the prior Performance Chemicals segment. During the second quarter of 2017, the Company performed goodwill impairment assessments before and after the segment realignment and determined that no impairment was indicated as a result of these assessments. During the fourth quarter of 2017, the Company performed its annual impairment test for goodwill and determined that there was no impairment as of September 1, 2017. Subsequently, the Company updated its goodwill impairment analysis as of November 30, 2017, based upon continued deterioration in certain portions of the coated paper market, the likelihood of the Company losing a significant portion of its paper business during 2018, and the bankruptcy of a large carpet customer. As a result, all of the goodwill associated with the Performance Materials segment was impaired and the Company recorded a goodwill impairment charge of $19.6 million. The impairment test for indefinite lived intangible assets consists of comparing the estimated fair value of the asset with its carrying value. The Company estimates the fair value of its indefinite lived intangible assets using a fair value model based on a market approach method or discounted future cash flows. If the carrying values exceed the estimated fair values, an impairment loss would be recognized in the amount of the excess. Key inputs used in determining the fair value of the trademarks/tradenames were expected future revenues and royalty rates, and accordingly, the fair values are impacted by selling prices, which for the Company is based in part on raw material costs. As of September 1, 2018, the Company performed its annual impairment test for indefinite lived intangible assets and recorded impairment of $1.5 million related to an individual tradename within the Performance Materials segment. As a result, the carrying value equals the fair value of this tradename as of the annual impairment testing date. A sensitivity analysis was performed by the Company on this tradename and a hypothetical 100 basis point increase in the discount rate used to value this tradename would result in additional impairment of $0.3 million. Trademarks and tradenames continue to be important to the Company, and we continue to focus on long-term growth, however, if recent trends continue, the long-term assumptions relative to growth rates and profitability of the trademarks and tradenames may not be attained, which could result in additional impairment to one or more of the Company's trademarks and tradenames. Estimating future cash flows requires significant judgments and assumptions by Management including sales, operating margins, royalty rates, discount rates, and future economic conditions. To the extent that we are not able to achieve these assumptions, impairment losses may occur. Finite lived intangible assets, such as customer lists, patents, certain trademarks/tradenames, and licenses, are recorded at cost or estimated fair value when acquired as part of a business combination. Intangible assets with finite lives are amortized over their estimated useful lives with periods ranging from 3 to 53 years. Intangible assets are evaluated for impairment whenever events or circumstances indicate that the undiscounted net cash flows to be generated by their use over their expected useful lives and eventual disposition may be less than their net carrying value. No such events or circumstances occurred in 2018, 2017 or 2016. Pension and Other Post-retirement Plans - The Company accounts for its pensions and other post-retirement benefits by (1) recognizing the funded status of the benefit plans in our consolidated balance sheets, (2) recognizing, as a component of other comprehensive income or net periodic benefit cost, the gains or losses and prior service costs or credits that arise during the period, (3) measuring defined benefit plan assets and obligations as of the date of the Company's fiscal year end consolidated balance sheets and (4) disclosing additional information in the notes to the consolidated financial statements about certain effects on net periodic benefit costs for the next fiscal year that arise from delayed recognition of prior service costs or credits and transition assets or obligations. Asset Retirement Obligations - The fair value of an asset retirement obligation is recorded when the Company has an unconditional legal obligation to perform an asset retirement activity and the amount of the obligation can be reasonably estimated. In assessing asset retirement obligations, the Company reviews the expected settlement dates or a range of estimated settlement dates, the expected method of settlement of the obligation, and other factors pertinent to the obligations. Asset retirement obligations are not material as of November 30, 2018 and 2017. Foreign Currency Translation - The financial position and results of operations of the Company’s foreign subsidiaries are measured using the local currency as the functional currency. Assets and liabilities denominated in foreign currencies are translated into U.S. dollars at exchange rates in effect at the balance sheet date, while sales and expenses are translated at the average exchange rates each month during the year. The resulting translation gains and losses on assets and liabilities are recorded in Accumulated Other Comprehensive (Loss), and are excluded from net income until realized through sale or liquidation of foreign subsidiaries. Income Taxes - The Company follows the liability method of accounting for income taxes. Under this method, deferred tax assets and liabilities are determined based on the difference between the financial reporting and tax bases of assets and liabilities using the enacted tax rates that will be in effect in the period in which the differences are expected to reverse. The Company records a valuation allowance to offset deferred tax assets, if based on the weight of all available positive and negative evidence, it is more-likely-than-not that some portion, or all, of the deferred tax assets will not be realized. Changes in tax laws and rates may affect recorded deferred tax assets and liabilities along with our effective tax rate in the future. earnings, carry-back and carry-forward periods and tax strategies that could potentially enhance the likelihood of the realization of a deferred tax asset. The weight given to the positive and negative evidence is commensurate with the extent to which the evidence may be objectively verified. It is generally difficult to outweigh objectively verifiable negative evidence of cumulative financial reporting losses.